WOMEN IN ENGINEERING – THE FUTURE? 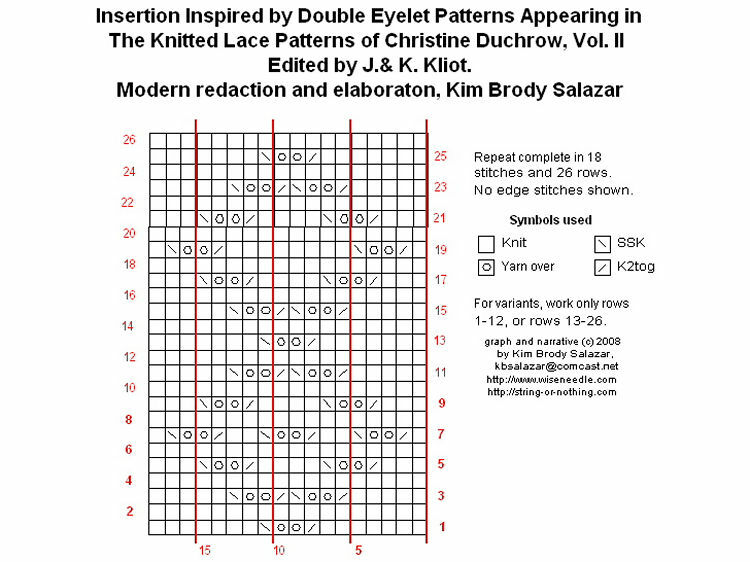 UPDATE: THE PANEL INSERTION PATTERN BELOW HAS BEEN ADDED TO THE PDF COLLECTION AT THE KNITTING PATTERNS LINK, ABOVE. Like most parents, I spend a lot of time rolling my eyes at what passes for homework and school assignments. There are way too many feel-good tasks – making posters and collages, even well into high school. Where are the analytical reading pieces? Where is learning how to write a convincing essay? But every once and a while something engaging and creative is requested. 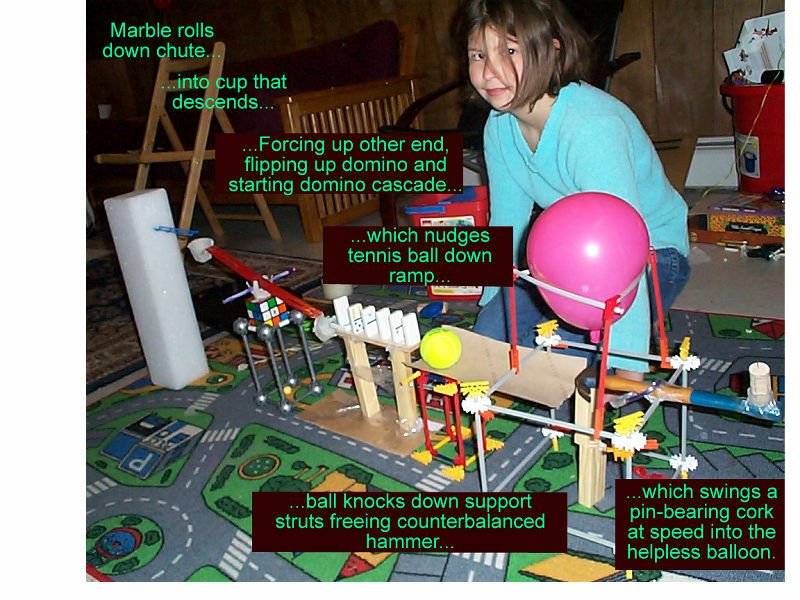 This month Smaller Daughter (now 9) had to construct a Rube Goldberg device, with a goal of popping a balloon. I sat on my hands and watched her experiment for the better part of a week. She scribbled out her designs and went down several possible paths before settling on her device components. She constructed (and re-constructed) each station scrounged from toys and oddments at hand, testing out each one individually, then assembled them into her final chain reaction. Eventually, after much tinkering she got it just right, and the whole thing worked as intended. I wish I had a video camera, but you’ll have to use your imagination. Especially the part where the balloon makes a satisfying pop, and she leaps up in triumph. Click on any thumbnail on this website to see detailed pix. Someday I will loose this proto-engineer on the world. I hope the world will be ready. In knitting news – not much. I’ve been working like a demon. All I’ve had time to do over the past two weeks is one mindless sock. For me to take two weeks to knit one sock says a lot. This one is a standard 72 stitch sock with a figure-8 toe and short rowed heel, worked using five DPNs. That calculates out to 18 stitches per needle. My insertion strip is 18 stitches wide as graphed below, so I do the pattern in its entirety once on each of the four working needles. I’ve stuffed a piece of white paper inside the sock so you can see the diamond patterning. and provided a chart for the simple design . I used Meilenweit Mega Boot Stretch, knit at about 9spi. The shaded reds with the touch of orange is color #709. I’m not wild about this yarn. It feels nice and cushy knit up, but I don’t enjoy tensioning it. The stretch is throwing my gauge off a bit, especially on my heel’s purl rows. It also is rather lofty unstretched, and prone to catch and split on needle tips. I’ll post a review of the stuff when the pair is finished. Opinions expressed are my own and not necessarily those of my employers. Also, kudos on the excellent Rube Goldberg device!